The alternator is a critical component of the entire vehicle. It is tasked with generating electricity based off the motion of the engine in order to power electrical components throughout the vehicle, including sensors, power accessories and the fuel injection unit. Understandably, should the alternator suffer trouble, the car as a whole can feel the pains. 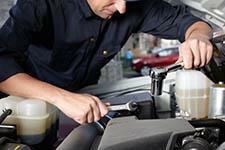 If you run into any of the following issues be sure to head to your local auto repair shop for proper diagnostics and expert repairs. One of the most common early signs of alternator troubles is dim or flickering headlights. This occurs because the alternator is what produces the electricity that keeps the lights on. If the alternator can no longer generate the proper current, the lights will go dark. Another issue that occurs regularly when the alternator is not operating correctly is the radio struggling to get reception. The radio may also jump between stations or not be able to play at all. As the problem grows you will begin to experience issues with power accessories, such as GPS, power windows, power seats, heat warmers and other items of the like. If the mounting bolts that hold the alternator in place come loose it is probable that you will hear a rattling or grinding noise when you try to start the car. If the car does start the rattling sound will likely continue. Peeking under the hood will likely reveal that the alternator is vibrating or shaking about. Since the alternator is tasked with keeping the battery charged a failed alternator will then drain the battery and prevent the car from starting. While you may be able to jump start the car to get on the road, if the battery continuously dies then it's certainly time for a new alternator. If you suspect your car is suffering from alternator trouble head to the shop before you end up stranded. For professional alternator repair in Birmingham head to HESCO Automotive & Performance Center. We take pride in our auto repair abilities for all makes and models. For expert auto repair in Birmingham, AL, give us a call at (205) 526-3796 to schedule service!